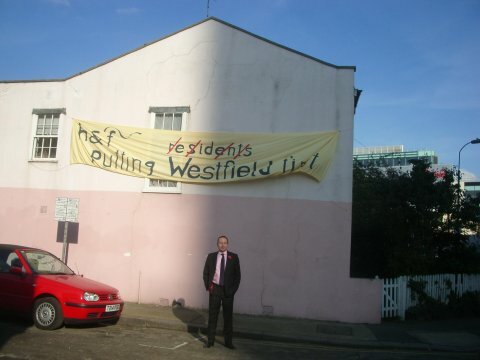 The above is a truly terrible piece of political communication for the following reasons: You can’t clearly see who the person in the photo is; you can’t read the message on the banner; the banner is poorly made / hung; the location of where the banner is hung looks run-down and unappealing. I was turned off by the campaign even before I could be bothered to read into what it was trying to achieve. This is the sort of communication that constituency level politicians subject on their electorate all too often. It’s no wonder people at worst, don’t trust and at best, are disengaged with local politics when this is the level of engagement. Andy Slaughter will soon be fighting for a very marginal seat in the next general election where communicating effectively will be essential to victory. This is just one example of how a local politician has let himself down with a poorly executed campaign. I know Andy is a hardworking MP and genuinly cares about the issues surround this campaign, but this looks lazy and complacent. When brands / politicians get lazy and complacent, they get overtaken. Why has he crossed out some of the letters on his banner? Uhh….. this guy needs a new Communications Director.